This is one way to have great fun with friends and families. 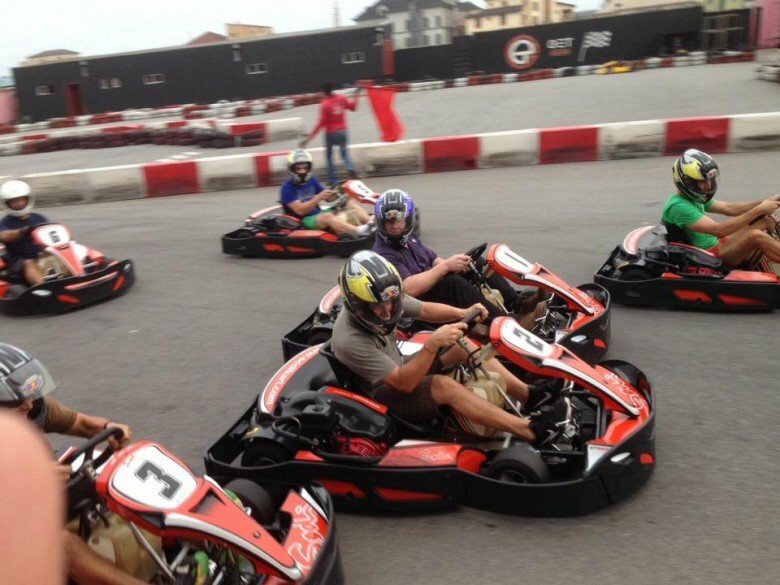 Go Karting is a safe recreational activity that will give you that childlike adrenaline rush. Having arguments about who the fastest driver among your friends is? Well, go find out at the GET Arena track located a walking distance from Four Point Hotel in Oniru Estate, Lekki. Spend time relishing the beauty and soul of Lagos in an artsy environment. The Jazzhole at Awolowo Road in Ikoyi is a great place for you to get soaked in a mix of good music, African artwork and books. The live jazz band at the Jazzhole will have you coming back. Depending on your preferred location, you can visit Terra Kulture in Victoria Island, Nike Art Gallery in Lekki or Osh Gallery in Yaba. Even if there is no ongoing art exhibition, you will still get to see their collections and interact with different art lovers around. Seeing the Las Vegas casino scene in movies can be very thrilling. If you would like to have a feel of the games, go to the Federal Palace Hotel & Casino in Victoria Island. The casino has a lot of slots and table games such as American Roulette, Casino Hold’em Poker and Black Jack. For those interested in learning the gaming skills, you can participate in the Federal Palace Casino Learners Night. Dance is a good form of exercise that gets you sweating out the weeks’ stress even as you have so much fun. You can simply just clear a space in your house, play your favourite dance playlist and get dancing. To make it more effective and social, it is better to join a dance or an aerobics class. There are a number of aerobics studios in Lagos you can register with. Take a trip to the Lekki Conservation Centre located along the Lekki-Epe Expressway. The centre, covering 78 hectare, houses a number of animals such as monkeys, crocodiles, birds and snakes. Delight in the stunning reserve vegetation and take up the challenge to climb the tree house and walk through the canopy walkway. The canopy walkway, at 22.5m high and 401m long, is the longest in Africa. To enjoy the panoramic view of the reserve area, make sure to take the canopy walk. Artsy, nature lover, fitness or casino game enthusiast, where have you covered. Before you get bored of Lagos, you should visit these places and share your experiences with us. Did we miss any fun activity you are already enjoying? Do let us know too. That's good to hear. Thank you for the comment.